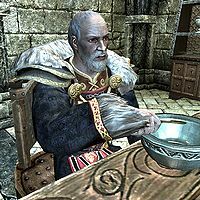 Emperor Titus Mede II is an Imperial acting as a decoy in place of the real Emperor, during the Dark Brotherhood quest To Kill an Empire. He was put there by Commander Maro as part of a conspiracy to rid the Brotherhood of their new Listener, namely you, and will be seated in the dining area of the Emperor's Tower of Castle Dour in Solitude. His real name is never given. He wears Emperor's robes and a pair of fine boots. Noblewoman: "But aren't even you the least bit nervous? After everything that's happened?" Titus: "You mean the wedding? My cousin's apparent murder? An unfortunate misunderstanding, no more. Cold mead, hot tempers... these things happen." Nobleman: "Quite. Yet that recent business with the young officer. Maro, was it? How dreadful. The son of your commander, plotting your assassination." Titus: "Yes, an unfortunate turn of events, that. But an isolated incident. And I have been assured that the fault was with the man's son alone. Truth is, we are in no danger whatsoever. Killing an Emperor can be useful, but befriending one? Now that's beneficial - as I'm sure you'd all agree." At this point, he will look up and say: "Aha! Here we are. Honored guests, I present to you - the Gourmet! Ah, the Potage le Magnifique. So delicious. My friends, as Emperor, I of course reserve the right of first taste." While the guests laugh, it is possible to speak to Titus, who will say: "I've been waiting for this opportunity for a long time. ", "So glad we kept you in Skyrim. Serving your Emperor was worth the wait, of course. ", "You're not at all what I expected. I imagined you'd be fatter, honestly." and "You've done your duty and we're all very grateful. Now... I'd like to eat." The Emperor will taste the soup and his next line depends on whether or not you poisoned the dish. If it is okay, he will say: "Oh... Oh how marvelous. Just delicious. It is everything I had hoped it would be. Please, everyone. Enjoy." He will then just keep eating until you take action. If the soup is poisoned his reaction will be less pleasing: "Oh... Oh how marvelous. Just delicious. It is everything I had hoped it would be. It.... I.... I think something's... wrong... I..." He will then drop dead in his seat and the guests will panic while the guards shout: "By the gods! The Gourmet and the chef have poisoned the Emperor! Get them!" During your escape, you will run into Commander Maro who will clap his hands and thank you for the effort, although in an unexpected way: "That man was, by far, the most insufferable decoy the Emperor has ever employed. I'm glad he's dead. Ah, but I'm even happier that you killed him. You, an assassin for the Dark Brotherhood, have just made an attempt on the Emperor's life. Would have succeeded, had it been the real man." This decoy Emperor is identical to the real Emperor in every way except voice. This page was last modified on 1 May 2016, at 01:13.